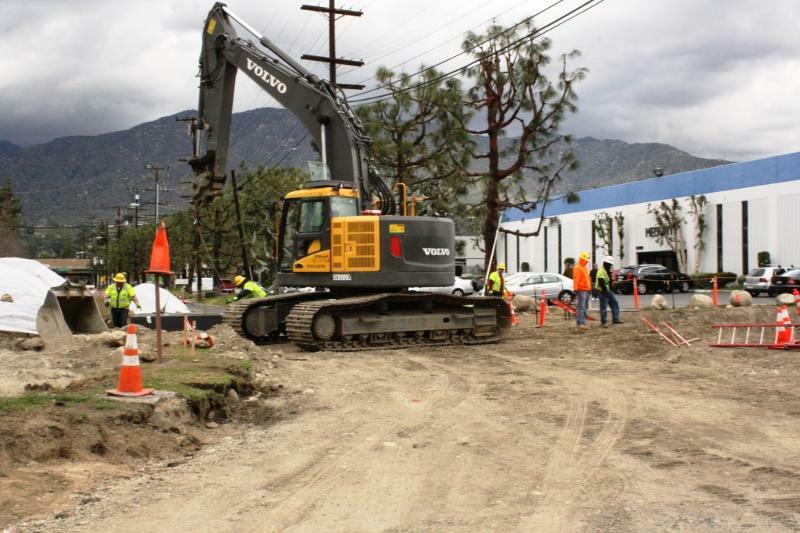 The following is the latest e-news from the Gold Line Foothill Extension Construction Authority, the agency building the 11.5-mile project that will extend the Gold Line from eastern Pasadena to the Azusa/Glendora border. The project also includes a new rail maintenance facility in Monrovia. The design-build team, Foothill Transit Constructors (FTC), is on schedule to have the project’s design work substantially complete next month. The majority of the nearly 100 design packages have been “Approved for Construction,” and the remaining packages are nearing 100% design. Significant construction is now well underway throughout the corridor. Bridge construction, utility relocation, grade crossing work, and even station construction can be seen at different points along the 11.5-miles. Some of these activities require street closures and other impactful activities. Stay updated and don’t get surprised by construction! Sign up to receive construction e-notices at www.foothillextension.org. 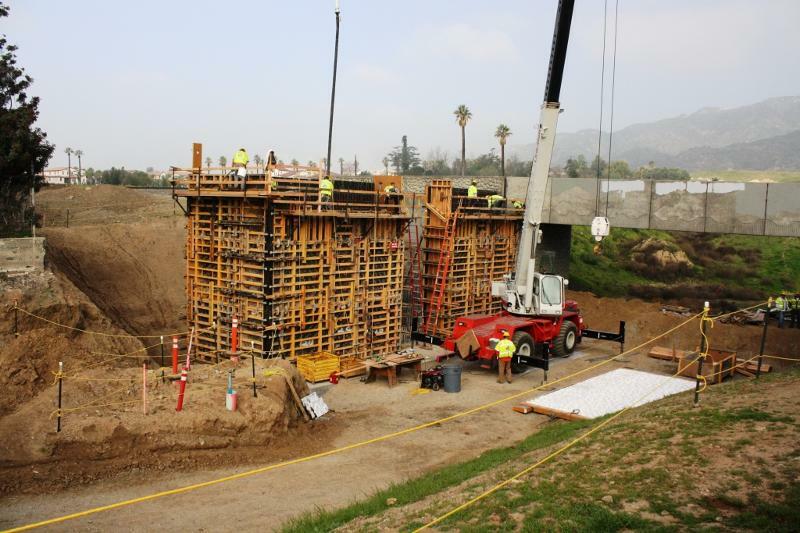 A bridge begins taking shape in Azusa. Utility relocation and mass grading is happening along the entire city of Azusa corridor, and the FTC team broke ground on the first major at-grade crossing in the city yesterday. Dalton Avenue will be closed for approximately six weeks to complete the crossing improvements. Click here to view the construction notice. 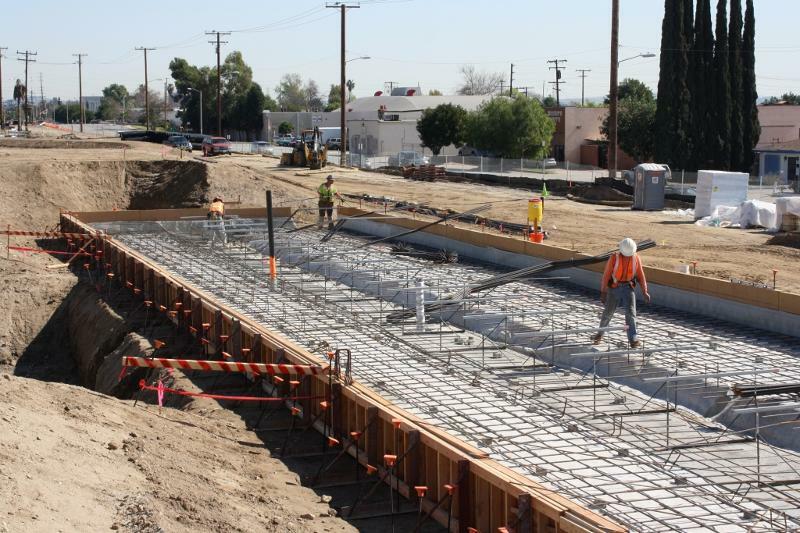 Additionally, to accommodate one freight track and two light rail tracks in the future, nine bridges at three crossings are also under construction in Azusa. Palm Drive is closed to thru-traffic for bridge work until May, and Foothill Boulevard has been reduced to one lane in each direction at the bridge crossing until September. Above is a photo of work on the bridge abutments at Citrus Ave. The Duarte station is the first of six new stations to break ground, and work continues on the nearby Highland Avenue crossing until early March. (Duarte station-work is shown below). Demolition of the old bridge abutments at Colorado Blvd is now complete, and work is underway on construction of the new dual-track bridge over this heavily-used street in the city. Colorado Blvd remains closed to thru-traffic until mid-April. Mass grading is now complete for the 24-acre, $160 million Gold Line Operations Campus in Monrovia. FTC crews are now focused on utility relocation and foundation work on the main building. Utility relocation on streets surrounding the campus is also on-going. Last week, the Construction Authority published the Final Environmental Impact Report (EIR) for the proposed 12.6-mile Foothill Extension from Azusa to Montclair. The Final EIR includes responses to comments received on the Draft EIR. as well as updates to the report itself. The Final EIR is posted on the Construction Authority website,www.foothillextension.org. The Construction Authority Board of Directors will consider certification of the Final EIR and project approval at their upcoming meeting on Wednesday, February 27, 2013. The meeting will take place starting at 7 p.m. at the Construction Authority Offices, 406 E. Huntington Drive, Monrovia, CA 91016. In the meantime, questions can be directed to Lisa Levy Buch, Director of Public Affairs at (626) 305-7004 orllevybuch@foothillextension.org. Hours: Mondays and Wednesdays ONLY: 8 a.m. – 4 p.m. Hours: Mondays through Friday: 8 a.m. – 5 p.m. Receive construction notices to your email: http://www.foothillextension.org. What will happen to the bridge over Huntington and Second? Visually, I can’t picture two tracks fitting on that portion of the right of way through Arcadia — the portion that is ‘elevated’ running from Huntington/2nd east to about Fifth Ave. The right of way will have two tracks – one in each direction. There’s enough room there.